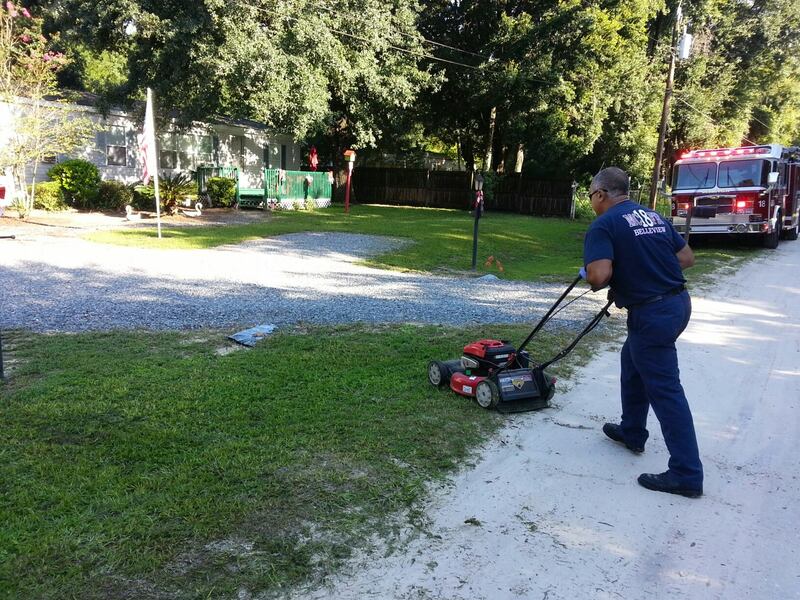 Marion County Fire Rescue [E18] mows patents lawn after he fell and sustained serious injury. Belleview, Florida — While an elderly man was mowing his yard Friday morning he fell and suffered serious injuries. Marion County Fire Rescue E18 and R18 were dispatched and promptly responded to the location of the incident. Upon arrival, both units began treatment. While R18 transported the patient to the hospital, E18 cleared the call in order to become available for other possible emergencies. Selflessly, instead of returning to the station, E18 personnel stayed behind and finished mowing the elderly man’s lawn for him. Crew members said that it only took a short time to finish the lawn. Emergency workers said that although lawn service won’t be found in the Marion County Medical Protocols or Fire Department SOG’s, “Doing the right thing” section, it doesn’t need to be written down for those who have sworn an oath to put others first. “From all of us at Firehouse 18 and MCFR, we wish you a full and speedy recovery sir,” MCFR said. The man’s condition is not known at this time.